At KaraNessian.com they are motivated every single day to create fabulous baby gifts that are fun, safe and most of all thoughtful with only the best products available on the market today! They create their gifts with the modern mom and baby in mind who want only the best at reasonable prices. They carry everything from baby gift packages to unique diaper cakes. Save on your next purchase with discounts, coupons and savings found here on 58Coupons.com. 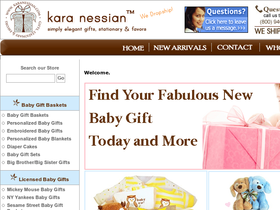 Find a fabulous baby gift basket at KaraNessian.com starting at only $39.95. Click link to view. Check out Kara Nessian to view these unique diaper cakes. Click link to view. Save a bundle by shopping KaraNessian.com and clicking on discontinued items. Hurry, supplies are limited and going quickly. Click link to view.